Valentine’s Day is approaching faster than I care to think about. My kiddos already have their valentine’s for their classmates planned, but weren’t sure what to do for their teachers. 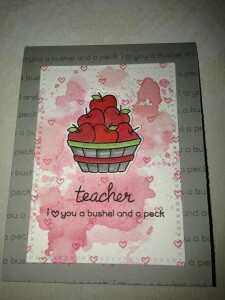 I found the Thanks a Bushel stamp set and was inspired. 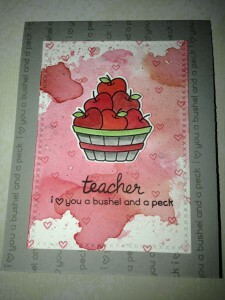 Extra Details: I started by stamping and water coloring the apple baskets. I used Distress Inks as water colors for these images. Once the ink was dry, I fussy cut them out. I die cut three cross stitched rectangles from water color paper. I used two shades of red Distress Ink to ink smoosh the backgrounds. I added some splatter with Black Soot Distress Ink for interest. 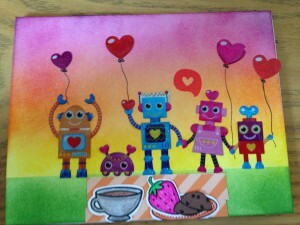 Once the backgrounds were dry, I stamped the small heart in red ink for added interest. Then, I added the sentiments in Versa Fine ink. I made three card bases from gray card stock. 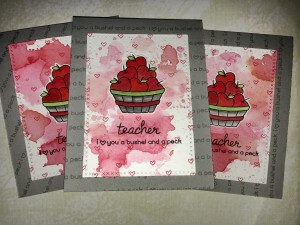 Using a grey ink, I repeatedly stamped a sentiment on each card base. I changed the orientation on each card base just because I could. I adhered the inked panels to the card bases and the cards were complete. 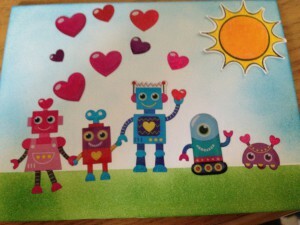 My kiddos got some Valentine themed robot stickers from their grandmother. Because they are my children, they wanted to make cards with the stickers. 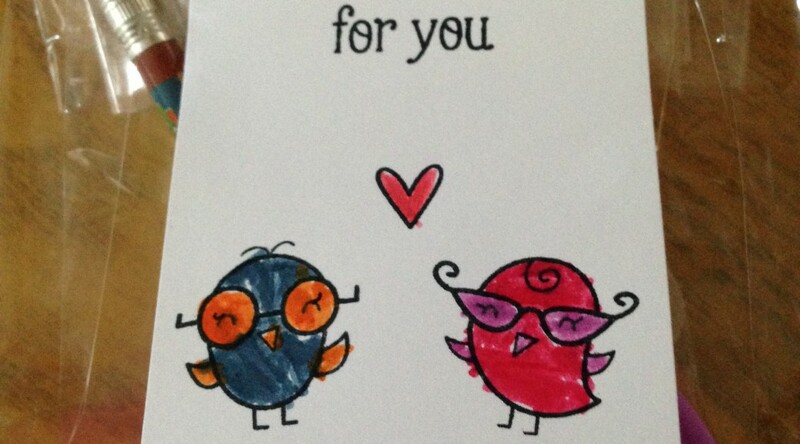 They gave these cards to their father for Valentine’s Day. Extra Details: We ink blended some backgrounds first. 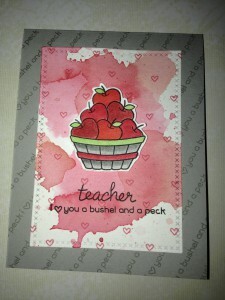 We added some stickers and fussy cut stamped images to complete the cards. Valentine’s Day parties at school are in a few days. 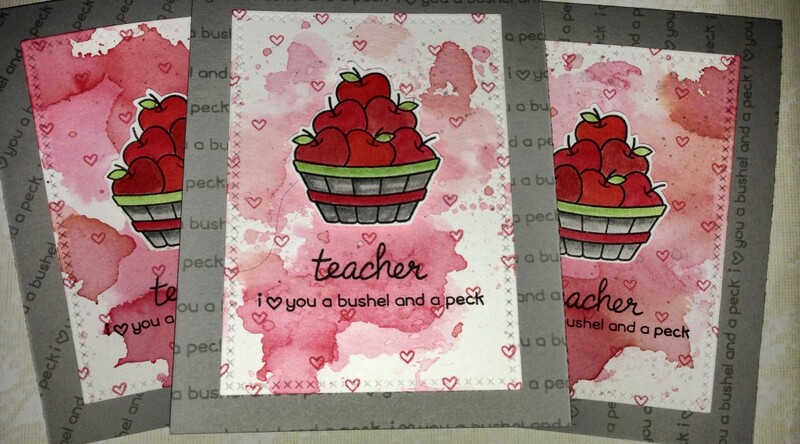 My kiddos wanted to give their classmates hand stamped valentines. This is my daughter’s. She gave her classmates heart shaped glasses. Extra Details: My daughter colored all the images with her Crayola markers. 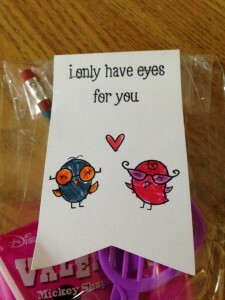 Valentine’s Day parties at school are in a few days. 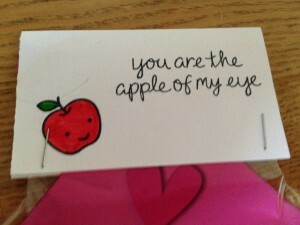 My kiddos wanted to give their classmates hand stamped valentines. This is my son’s. Extra Details: I colored this apple in with Crayola markers. My son and I split the coloring because his class is so large. I made a few fun interactive Valentine’s cards this year. 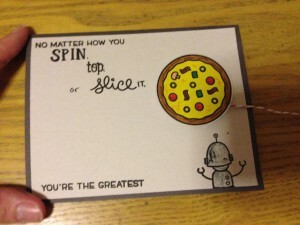 This card features a pizza that spins. Extra Details: I stamped the pizza on a small scrap of card stock and colored it in. I stamped the light grey layer next. I adhered the light grey layer to a darker grey card base. 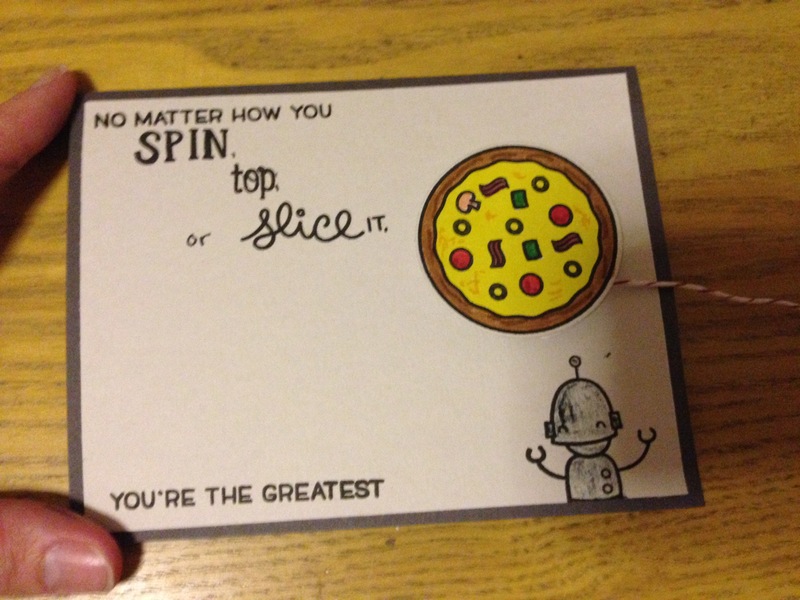 I attached the pizza to a brass tack, and then inserted the brass tack into the card from. I layered some twine between the brass tack and the card base. Everything was colored with Crayola markers. I was hoping that I could wined the twine around the base of the pizza and make it spin when the twine was pulled, sort of like a yoyo. That did not work. So I cut the twine shorter and just used it to help pull the pizza around.